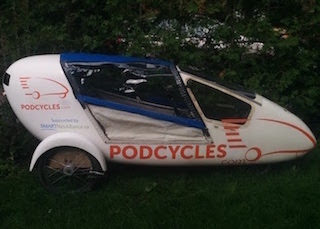 Podcycles is start-up based in Ottawa, Canada, sharing the 'Stormy Weather' velomobile using a mobile app. You can also email us to book your ride in Ottawa. Help us get to know your needs! 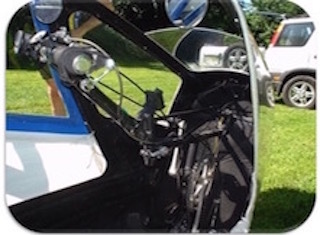 The full fairing can be closed to keep you totally dry in the rain and snow. A back-rest, adjustable seat, and comfortable riding position make it a smooth ride. Connect with us on facebook and instagram, keep track of when we arrive in your neighbourhood and sign up to visit us at local events. Podcycles offers one-way rentals from a growing network of stations in Ottawa. 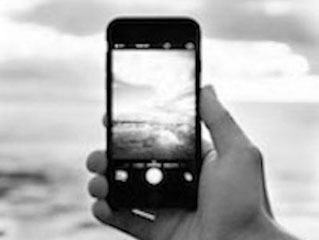 Sign up to the system and buy credits, then use the app to find available Podcycles nearby. Click 'rent' and the app sends a four digit code that unlocks the Podcycle. Once unlocked, the app will send you a second four-digit code: change the code on the lock to this new code right away. When you are done using the Podcycle, return it to one of the stations and lock it with the new four-digit code. Click 'return' in the app to end your trip.